Could you use more than $1000 in a savings/emergency/life happens fund? Just last week, we had to pay $600 to fix vehicle issues that were not covered by insurance. Stuff happens. Expensive stuff happens that blows our budget. The result of putting this plan into action is $1378 in your pocket. We’re going to modify the popular 52 week money savings challenge. What is the 52 week money savings challenge? This is the challenge where you save the dollar amount on the week that you start, so $1 for week 1, $2 for week 2 and so forth up until week 52 for a total of $1378. Saving money, no matter how you get there, is a good thing. We’re going to fix those two things with this plan along with a money challenge goal chart. This money saving challenge will become a goal we accomplish… possibly sooner than planned! We need to determine your purpose (or your “why”) for saving this money. Is it for your emergency fund? Is it for an extra mortgage payment? Do you need new tires for the car or a big appliance? Having a purpose will help us stay focused on our savings goal. We’ll use it in just a minute. You need to find a zipper pencil/binder pouch. There’s probably one in a used school binder around home if you have school-aged kids. They are also found at most dollar stores. The reason for this set up is to have the plan within reach at all times and to see cash coming into that bag! It’s like a portable version of a goal setting board. It’s a small set-up for success! Across the top, write in your money savings challenge purpose. Then, when you put the money in, simply highlight or cross off the amount it matches. The best part of this modified version of the 52 week challenge is that you can save the money in any order that works best for you! You can save in chronological order, reverse order, or skip around according to cash flow. Someone gives you a $20 bill for a gift? Put it in the bag and cross it off. You find $2 in an old wallet? Happy day… put it in the bag and cross it off! Even if you decide to transfer the cash to savings for safe keeping (and a little interest) after a few weeks, the cash in our bag and our checked off chart is proof of progress. How much money do you have after 52 week money challenge? Now let’s shift and focus more on the “how” part of the saving challenge. These ideas will get you started and help you gain some momentum. Put your loose change all in one place. Check the car, the laundry room, in unused purses/wallets and anywhere else that coins like to turn up in your home. It’s amazing how much loose change adds up! Skip the $5 Starbucks. Make a coffee at home and cross off that $5 savings goal when you add it to your money bag! Brown bag it for a day or two instead of a usual lunch out. Steer clear of the vending machines and take some snacks from home. Plan out a few simple meals that are cheap to make and can be made in bulk for freeze ahead meals. My favorites that meet this criteria are my friend Julia’s oatmeal bars for breakfast and my family’s tried and true favorite supper taco soup. For lunches, it doesn’t get much easier than a loaf of bread and jar of peanut butter. Turn a usual $100 trip to the grocery store into a $85 trip and put the difference in your savings instead. Easily accomplished by sticking to a list, buying an off brand name, and shopping on a full stomach. Some of these things may seem too small to make a difference, but the beauty of savings is that every single cent counts. Easiest way to start with $25-$50 without much effort…. find a few items around your home to sell! If you have kids and just haven’t gone through their seasonal clothing that they have outgrown, that’s a great place to start! People are willing, and eager, to buy gently used kids’ clothing for anywhere in the $4-$8 range for an outfit. Single pieces, pajamas, and shoes will sell too. What else besides kid’s clothing? You probably have just one or two items to sell that could easily bring in $25 or more to start crossing off those savings goals. If you have many items to sell, a garage sale would be a great opportunity to cross off your savings goals (and declutter too!) A yard sale could easily bring in $100 and you could cross off the $49 and $51 blocks! The fastest place to find buyers for a few items is usually your place of employment (if allowed) and by word of mouth among friends/family. That’s it! 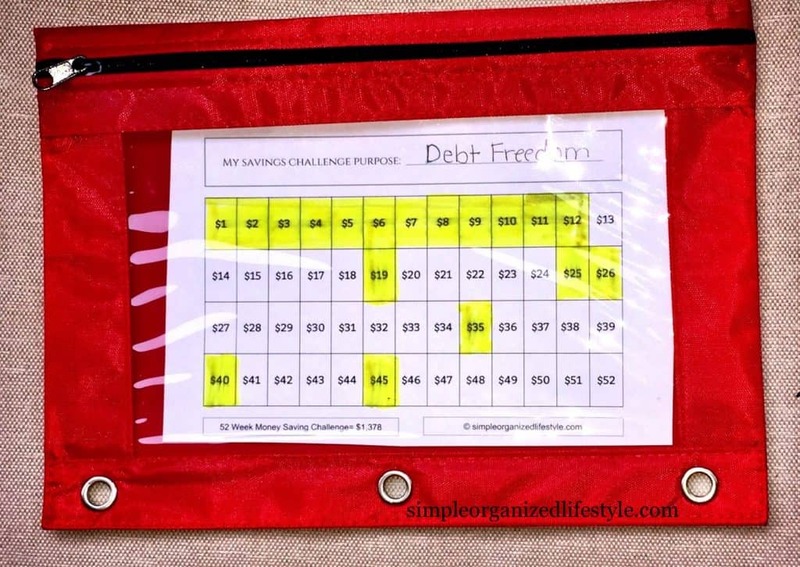 This modified system of the 52 week money savings challenge is set up to put $1378 in your savings. My guess is it’s going to happen even sooner because once the money is flowing, so will your ideas and motivation. 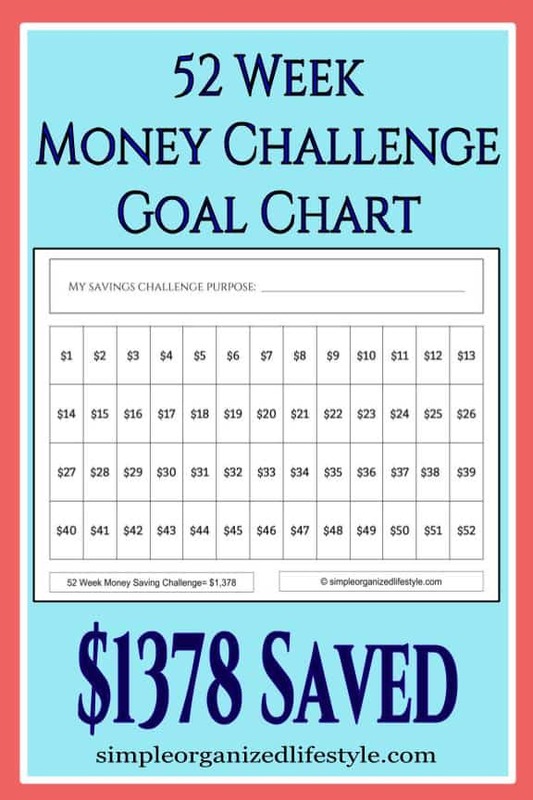 If you want a savings goal tracker as you complete the challenge, feel free to check out the options in the resource library, inside the “money management” folder. It is so nice to have a “rainy day” savings. My husband and I have always had that. Even when we were poor collage students. We would budget every month and then half way through the month we would see how we were doing on our budget and where we could do better to make up for where-ever we may had gone over. And then at the end of the month we would go over it again. It took time, but it was so worth it! I like the challenge. What we are focused on we will have a much greater chance of succeeding. Thanks again for good content. A budget may not be on the “fun” list, but it makes a world of difference when it comes to finances. You are so right, very worth it! Thanks Kristine!